Copyright © 2006-2018. It is illegal to download photos or reuse information off this site without written permission. 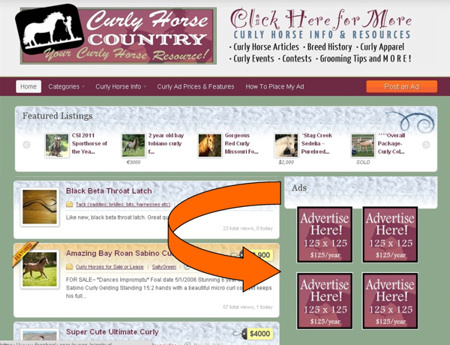 There are MANY awesome ways to advertise on Curly Horse Country! I hope you will take advantage of this site and it's ability to reach hundreds of wonderful viewers daily. Since the creation of this site in November of 2007, I am delighted to say it has reached top ranking on all the major search engines! This site has much to offer! Together we can help promote this incredible breed and through knowledge and sharing, get more people excited about our Curlies!! Curly Horse Country is about sharing information and having a strong sense of community. As a way to say Thank you to anyone that contributes in any way, (ie photos or articles) I will offer a free link (email or website) to your farm. Start a horse blog, open a youtube channel and I will add your link FREE to our links page. Breeders: Ad this banner to your links page and I would gladly offer a reciprocal link. Upgrade to Featured Listing for just $10 more! Advertise your Farm or Stallion at stud using one of our TOP Ad spots on Curly Horse Country's NEW Classified ads section! These are sold by the year. $125/year. Home Page Sales Photo Ad - $30.00 per 3 months or $50/6 months. (includes free ad listing in our new classified section! Photo links to ad. All of the Home Page ads are in huge demand with limited spacing. If you will note, each ad place on the home page has a tiny expiration date at the lower right corner, like this: (3/13) That means that particular ad expires on March of 2013. The owner of that ads has first rights to renew and then it is offered up to the public or to the next person on my waiting list. If you would like to be put on the waiting list please email. Home Page Sales Photo Ads: These ads are for curlies for sale. There are TWELVE (12) slots available. They run for 3 months or 6 months. Cost is $30 per 3 months for this ad or $50 per 6 months. 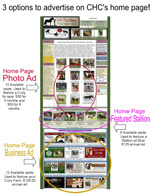 Home page Business Card Ad: These ads are for curly breeders advertising their farm/ranch. There are TWELVE (12) ads available. These ads run for a full year. Breeders may update their business ad anytime during the 12 month ad period. A link directly to the breeder's website is added and if they have any curly horses for sale on curly horse country, that link can be added as well. The cost is $75 per year for this ad. This option was set up with breeders in mind, but anyone can take advantage of this great savings deal. Buy unlimited ads for just $49/year*. List as many ads as you like in any of the 7 categories for one full year! Paypal is best, contact CHC for information and address. Thank you for supporting CHC! I will do whatever I can to help you in promoting your business, farm or horse. I care about you getting the best bang for your buck and I will do my very best to maintain this site to the best of my ability. As well as keep it fresh, with new and interesting topics discussed to keep traffic flowing and help owners connect on a deeper level.